Guess who’s coming to dinner folks? The unwelcome guest at a dinner party is a staple of drama, and this Mike White-scripted movie, superbly directed by Miguel Arteta, makes the most of the device for its own radical purposes. The unwelcome guest is Beatriz (a glammed down Salma Hayek, if that is possible) who works as a soulfully intuitive massage therapist at a cancer clinic outside Los Angeles. A Mexican immigrant, she stands out like a sore thumb among the rich white guests at a luxurious seaside villa. Normally, of course, she wouldn’t have been invited, but she has just given a massage to the madam of the house, Cathy (Connie Britton), and then discovered that her car has broken down. Cathy, who is particularly grateful to Beatriz for helping to heal her daughter’s cancer, duly invites her to stay over. 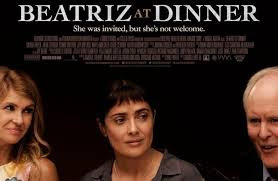 The guests at Cathy’s husband’s “business dinner” include a wolfish real estate developer, Doug Strutt (John Lithgow), a character who serves as a kind of Trump-like devil to Beatriz’s angel, although this would imply the kind of crude stereotyping that the movie isn’t guilty of. I don’t want to reveal any more of the plot, but the clash between Strutt and Beatriz is philosophically, politically and socially shattering. Hayek is a wonderful mixture of intensity and stillness in the role of the alternative therapist who believes in “souls”, tends to her land and animals and greets strangers with hugs. We view the dinner party through her quietly horrified eyes, and at times we squirm with embarrassment at the guests’ attitudes. Lithgow is, of course, superb as the heartless developer, having played any number of oleaginous business barons in his distinguished career. What is particularly impressive, however, is that the chemistry between himself and Hayek suggests something more than the obvious clash of cultures and political and economic opposites. The tone of the film gradually darkens after its semi-comic opening scenes, lending a sense of real despair and tragedy to a film that we initially think of as a social satire. This is the kind of movie that can disappear almost as quickly as it arrives, particularly at this time of year, so I would encourage you to watch it as soon as possible.